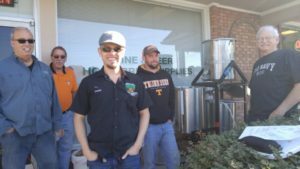 Learn to Homebrew Day was a great success! Thanks to everyone that came and special thank to Wayne and Darlene for their support of the club. We made the news! Come join TVH as we brew out in front of FermentStation. The event is on Saturday November 3rd. We will be starting our 15 gallon all grain demonstration around 10am. There will be staff on hand to help you if you are just getting started or considering brewing for the first time. Australian sparkling ale: West Knoxville utility district water ph 7.7, calcium 40, magnesium 10, sodium 10, sulfate 6, chloride 11, and bicarbonate 138. Mash temp was 156 for 60 minutes with half the volume of water and fly sparged with the other half at 165. It’s that time again! On March 10, 2017 from 1 to 4 we shall gather in the back room of the Hardin Valley Casual Pint and crown a champion. Everyone is invited to enter and everyone is invited to judge. No skill required! Please send me an email to Daniel if you want to enter and I’ll coordinate with more information. Results for Homebruin Cup can be found here! We brewed 10 gallons of Oatmeal Stout. About 4-6 folks who weren’t in the club came out to check us out. Thanks much to FS for donating all the ingredients. The batch was split and WLP007 and WLP004 yeast were pitched into the different 5 gallon better bottles. Look to sample the beer at the club Christmas Party. Come join TVH as we brew out in front of FermentStation. We will be starting our 10 gallon all grain demonstration around 10am. There will be staff on hand to help you if you are just getting started or considering brewing for the first time. More advanced brewers are welcome to join us to see the club’s system in action.